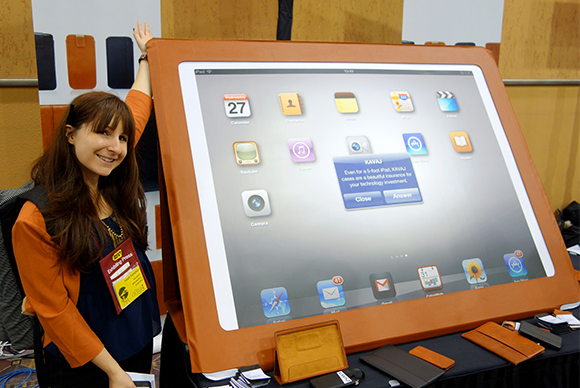 LAS VEGAS—If Apple ever releases a table-sized iPad, Kavaj has you covered. The German-based iOS accessory company showed off a 5-foot long iPad case at CES, complete with a giant faux iPad to go along with it. Kavaj brought a slightly enlarged tablet case with them to CES. Of course, the gimmick was designed to bring attention to Kavaj’s latest line of cases for the iPad, iPad mini, and iPhone 5. One case that really stood out was the Dallas case for the iPhone 5, which combines a folio-style front cover with a wallet pouch on the case’s back. The Dallas is extremely thin, yet still shows off Kavaj’s signature genuine leather. 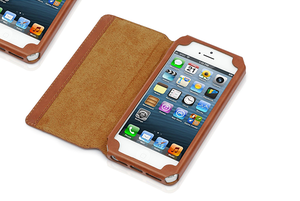 (All of Kavaj’s cases are made from genuine leather and are available in either solid black or camel.) The inner lining of the front cover features soft suede to protect your iPhone’s screen, and hidden magnets keep the flap closed when not in use. 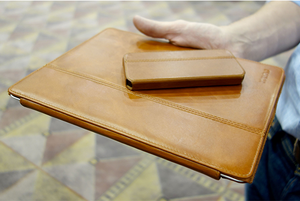 The Berlin case for iPad, and the outside of the Dallas case for iPhone 5. Also on display were the Berlin and London cases, available both for the iPad (third- and fourth-generation) and the iPad mini. The Berlin is a sleek folio-style case that folds back to allow you to prop up your iPad in different angles; the London is a little bit more sophisticated, with folders for business cards and other documents. The London also includes a stylus that doubles as an ink pen, and the case includes a stylus holder. The entire line is available through Kavaj’s website and through Amazon.com. The Dallas for the iPhone 5 retails for $35; iPad mini cases start at $40; and full-sized iPad cases start at $50.